Happy New Year Everyone! Let’s dive right in! 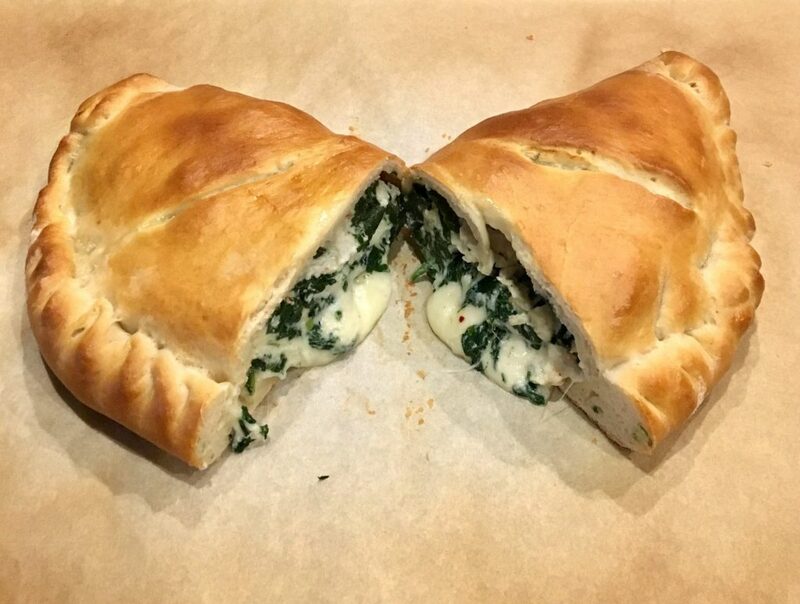 Wanna know where the inspiration for these Spinach Ricotta Calzones came from? It is not a family recipe, and it is not one I have ever made before. 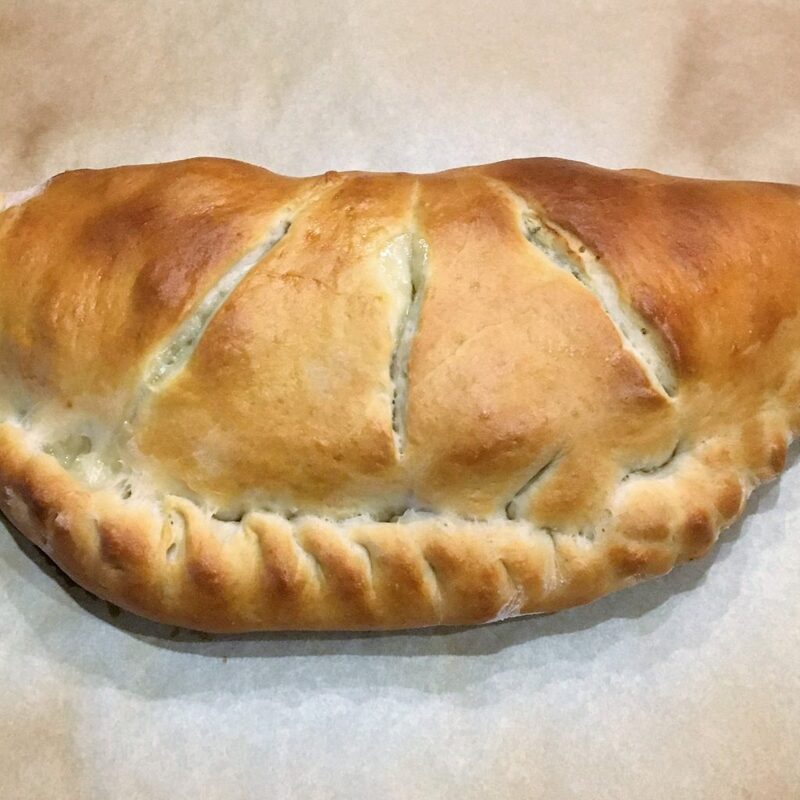 I have made calzones, but usually they are more like a pizza in a turnover…lots of meat, mozzarella cheese and even marinara sauce. But, this recipe came about for two reasons. First, I asked my husband to start giving me new ideas for meals as our diets have changed over the years. We seem, just naturally, to be eating more vegetables and less meat. I also wanted to start showcasing recipes where I am using my appliances and gadgets that are collecting dust on my shelves. You know the ones…the pasta maker, the juicer, the Instant Pot, the tagine, WHAT? Yes, I even own one of those. Well, today, we are going to bust out the bread machine. Actually, I have owned several bread machines over the years, and I love them. So, I want to help you to find a reason to use yours. You know, I think the real reason we do not use many of our appliances is that initially we have great intentions, but then once we start reading the owners manual, we get scared, and put the thing right back in the box. All we really need is someone to walk us through the steps and show us how easy it is to use. That is how I was with the Instant Pot. My son had to break it in and show me the ropes. The Instant Pot will definitely be used in a future post, so keep an eye out. 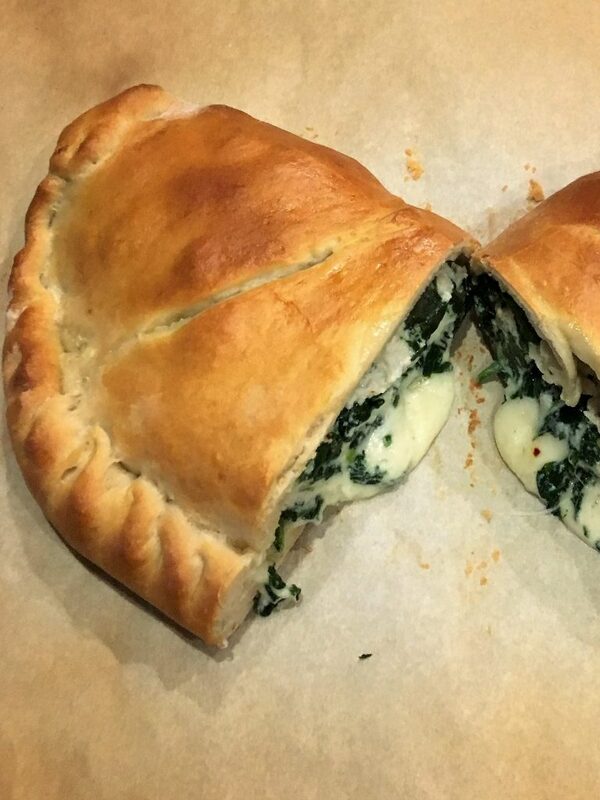 Anyway, back to Spinach Ricotta Calzones and how my bread machine makes it a super easy recipe. As I said, I love my bread machine, but I actually do not make a lot of bread in it. What, no bread in a bread machine? True. I actually make more dough in it, which in turn ends up as dinner rolls, focaccica, cinnamon rolls, and yes, calzones and pizza. Most bread machines have a dough cycle that perfectly mixes, kneads and proofs the dough in hardly any time. Then, you work the magic and turn your lovely dough into all sorts of culinary creations. It is sort of comical every time I make a new recipe, whether it is one I find in a cookbook, online or in a magazine, or if it is one in my stash that I have never tried, I always just tell myself that I can do it. Try it once. Either it works out or it goes in the “NO” file. My kids are always amazed that I will just tackle a new recipe, sight unseen, never attempted, never schooled in and just go for it. I think that is what cooking is all about and that is definitely what I teach in my cooking classes. Do not be intimidated by any recipe. Tell yourself you can at least try it or get someone to help you try it out. If you stay locked in fear of cooking and your skills, you will never learn and expand your culinary horizons. So, with that pearl of wisdom I wish you a Happy “New Year of Trying New Recipes” from the Memorable Kitchen! In a bread machine, place water, sugar, salt, 2 tablespoons olive oil, bread flour and yeast. Turn on dough cycle. If using a mixer, soften yeast in a small bowl with water and sugar. Let set for 5 minutes. Place in a mixing bowl. Add in olive oil and salt and mix for 2 minutes. Slowly add in flour, a cup at a time. Process in the mixer using a dough hook or paddle for 5 minutes after all flour is incorporated. Remove bowl from the mixer. Cover the bowl with a clean kitchen towel and let rise for 1 hour. While dough is rising, place 1 tablespoon olive oil in a saute pan over medium heat. Place chopped garlic in pan and cook for one minute. Add spinach, salt and pepper and cook until wilted. Remove from heat and let cool. Place in a strainer and squeeze out excess water. Set aside. In a medium bowl, place ricotta cheese, mozarella cheese, parmesan cheese, salt, pepper and seasoning. Add in spinach mixture and stir until combined. Turn dough out onto a floured surface. Have a cup of warm water standing by for sealing the calzones. Divide dough into 4 equal pieces. Starting with one piece of the dough, roll out with a rolling pin into a 10 inch circle. You may have to dust your rolling pin with flour to keep from sticking to the dough. On one half of the dough circle place 2-3 mozarella slices, leaving a ½ inch space along the edges. Place ¼ of the cheese/spinach filling on top of cheese slices. Brush edges of dough circle with a little bit of warm water. Fold the top of the dough over the filling. Press down to seal and then crimp or fold edges of dough in to seal completely. Place on a parchment paper lined baking sheet. Brush the top of the calzones with egg wash (1 egg mixed with 1 tablespoon water). Make 3 slits in the calzone. One in the middle from top to bottom, then two on each side. Repeat with other dough and filling to make 4 calzones total. Bake at 450 degrees for 15-20 minutes. Serve with warm marinara sauce if desired.